More and more people today are acquiring the skills for making wood pellets in small scale at home. The other reason as to why pellet making is generating a lot of interest is because pellet heat is taking over as the core source of fuel in the homesteads. You no longer need to go commercial to get biomass pellets but if you get the relevant knowledge on how to manufacture them on your own it is really simple. What do we mean by biomass pellets? We cannot proceed without defining what we are just about to talk about. This term stands for any wood or biomass matter that is compressed into pellet form to be used as fuel. Biomass includes wood, grass, rain and all the other forms of agricultural material or waste. 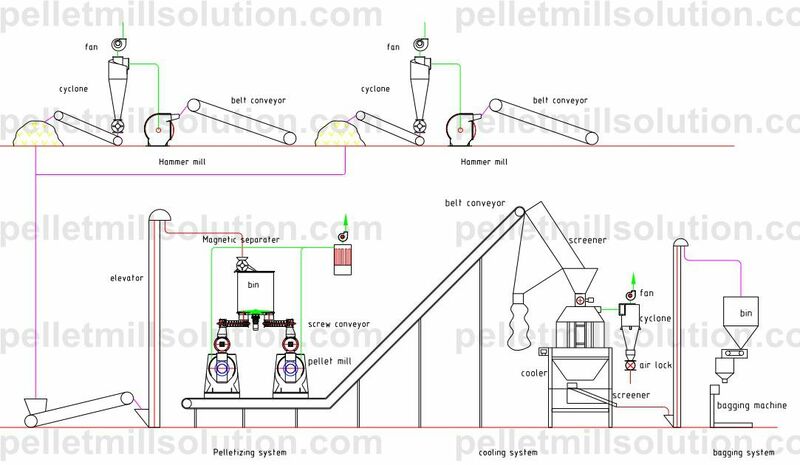 The process of making pellets is the same for most biomass materials, but for demonstration sake, we will use wood. First you need to break down the biomass or wood materials into small pieces. For wood you will need to break it down into sawdust. You can either use a hammer mill or a chipper to grind it down into dust. A hammer mill basically is used to break this material to the finest state. For the process of making pellets to be successful, you need to dry the wood dust but not completely. A small amount of moisture is required. Ten to twenty percent moisture is enough for all the raw materials. After the drying process you can then pre heat, the moist dust to make it easy for pellet making. You should ensure that you do not apply direct heat and also over heat this raw material. Pellets are bound together by some adhesive. Some plant materials do have a natural binding element and therefore do not need any additives. Some people use glue which equally works well. Additives serve a special function in the production of pellets. They serve to help in lubrication, decreasing combustion rates and also for bonding purposes. Binding additives also assist to reduce fine dust produced during transportation. They also assist to improve the durability of the pellets. Other plant materials that do not produce enough heat need some additional additives like vegetable oil, flour, starch, and any other binding agent. The pelletizing mill machine has two very important physical parts; the roller and the die. The die is a flat surface that has many small holes drilled into it equal in size to the pellet size. At the top side of the die, the diameter of the holes is bigger than at the underside where the exit of the hole is. The die is made of a metallic flat surface. The next part is the roller. It works the same as the kitchen rolling pin and it is used to roll and spread the final moist wood dust on the die. When the moist wood dust is rolled over the die, it passes through the funnel shaped holes and gets compressed as it exists on the bottom side. This process generates a lot of heat that melts the additives or binding matter. The heat is produced due to the pressure and the friction produced. The pellet cools down as it comes out on the other end of the die. The binding element in the pellets then cools down producing nice and well-shaped pellets ready for use. The process is a little bit involving and you might not get it right at the first time. But if you have the right knowledge, good material, quality pellet production equipment and some practice, you will end up making some really good pellets for use in your home and you can even decide to go commercial if you can produce more than you can use. • Due to their absorbent characteristic, they are very efficient materials in case of spillages. They come in handy in the oil industry or where there are any forms of spillages.